Construction and recycling of pavements using PolyCom has been increasing as engineers and designers more fully understand the benefits of the product. A Pavement Stabilised with PolyCom does not suffer the fatigue and shrinkage cracking problems of cementitious binders particularly noticeable when installed into thinner pavement designs. Apart from delivering significant strength increases the product also introduces a high degree of water resistance and flexibility which makes it a very useful tool for stabilising lower strength gravels. Engineering benefits include – increased material strength through wet and dry cycles, consistent design parameters, uniform high densities in the constructed layer and a national testing protocol. 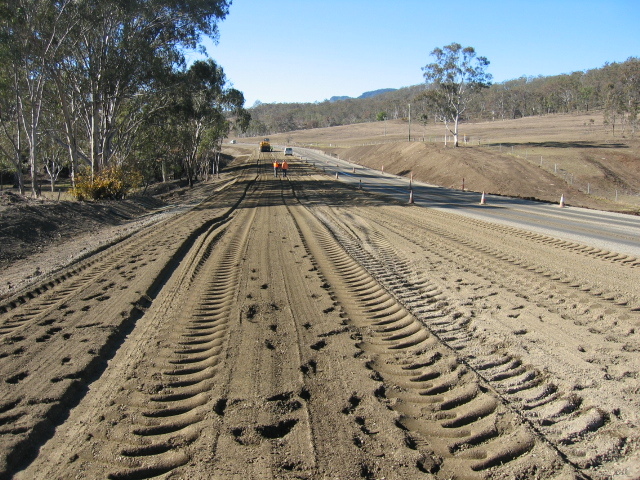 Works crews also benefit through improved material workability, the elimination of cure time constraints and installation by grader crew as well as rotivator. Standard works methodology using standard equipment, minimal transport costs and no extra time taken to install makes Pavement Stabilisation with PolyCom a more efficient, cost effective and sustainable solution. PolyCom strengthening road shoulders – What are the benefits? Shoulder stabilisation with PolyCom Stabilising Aid is fast, efficient and economic – the work pictured here was completed with a standard grader crew. 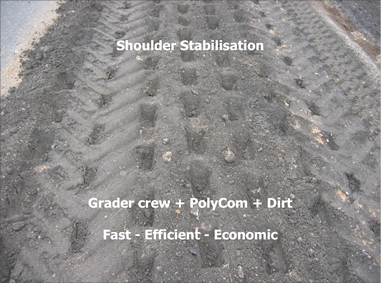 PolyCom increases the workability of variable soils and gravels which means that in most cases the shoulder can be built up and stabilised using material gained from the roadside as in the example shown. 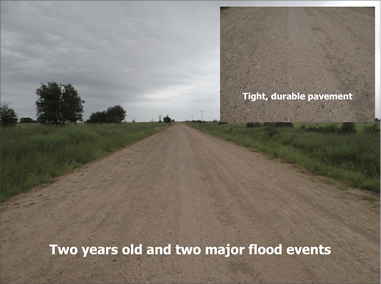 Stabilisation of unsealed road networks can be substantially improved from the point of view of durability, resilience and rehabilitation costs. 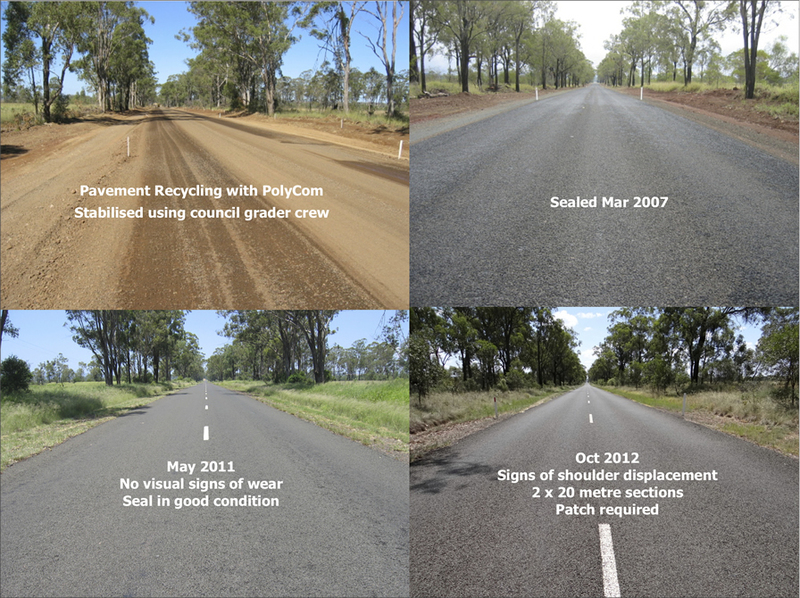 Stabilising with PolyCom delivers comparable results to cementitious binders but much more economically. PolyCom is suitable for use with most natural soils and gravels as well as manufactured materials. 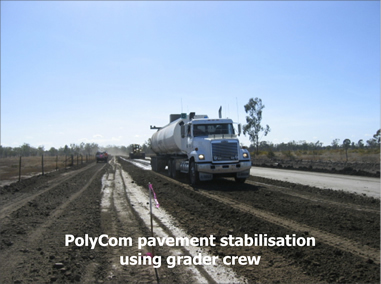 Grader crew stabilisation – PolyCom can be installed using your standard grader crew. There are no cure time constraints and the stabilised area can be re-worked at any time which means that future maintenance and further recycling events can also be achieved with the same plant. Reduce construction and maintenance costs – Stabilisation using your in house crew and plant means much lower construction costs for both large and small jobs and allows you to do this work as and when you need to. 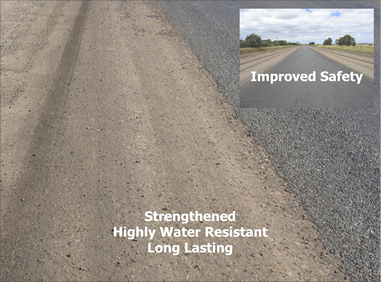 The resultant stabilised road surface delivers improved road performance through a reduction in dust and material loss, increased durability and a substantial reduction in ongoing maintenance requirements. Delete the re-sheet – Road pavements in many cases can be re-cycled and stabilised with PolyCom eliminating the need to re-sheet saving on natural resources and trucking costs. PolyCom improves workability which means variablematerialgained from the roadside can be blade mixed and blended back into the road surface during a standard ‘rip and re-compact’ adding significantly to a strengthened durable pavement. Improve weather immunity – Improving material strength and resilience adds to the service life of the road but more importantly in some areas is the introduction of a high degree of water resistance to the recycled pavement. Reducing the damage from heavy rain and flooding is a major priority for most asset managers as most communities are now expecting these preventative measures to be put in place. ‘Pavement Recycling’ or ‘In-situ Pavement Stabilisation’ is now the most logical choice as road authorities and councils have more pressure to better use their budgets, conserve natural resources and reduce carbon emissions. 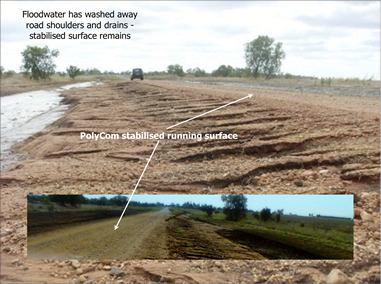 PolyCom addresses these issues as pavements can be economically recycled and stabilised using grader or stabilising machines and the stabilisation of these pavements can be repeated again in future years further reducing costs, emissions and unnecessary wasting of our finite natural resources. Pavement recycling with PolyCom – What are the benefits? In addition to the benefits listed above – PolyCom poses Zero OH&S concerns, Zero environmental concerns and we have been fully and independently carbon audited. It is now more important than ever to consider the environmental impact of any proposed works as a high priority. When assessing the triple bottom line cost of any ‘Pavement Stabilisation’ the carbon footprint of the binder/stabilising agent selected must also be included. The exclusion of this sometimes substantial figure from most published professional papers on stabilisation seems an unfortunate oversight!! 70% / year financial savings on the maintenance of the road.